Large-scale car-selling is now more convenient as eBay Philippines has launched eBay Motors Philippines as a vehicle-trading platform for financial institutions and leasing companies, car manufacturers and corporate groups. eBay Philippines country manager Muralikrishnan B said eBay Motors provides "a high-velocity transaction platform for corporate to liquidate their used vehicle inventory in the most efficient and transparent manner." "We have successfully pioneered the B2B Motors concept in India and have brought this domain expertise to set up the Philippines Motors business," the eBay executive said. B2B, or business-to-business, transactions are expected to grow further in the Philippines as connectivity and data accessibility expands. 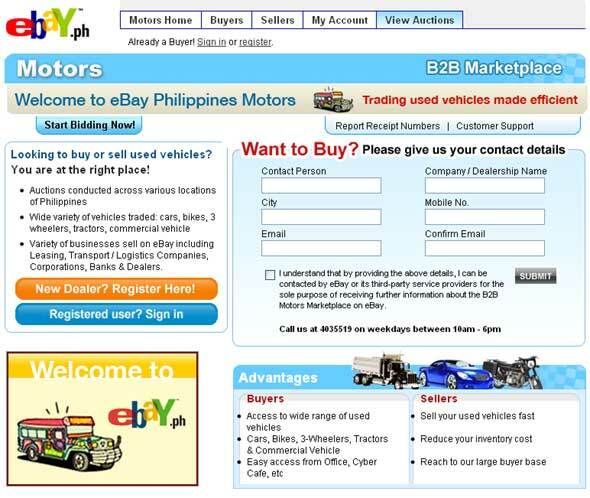 "We believe the B2B Motors platform will add significant value to corporates, and buy-and-sell dealers in the country who want to efficiently trade their motor vehicles," sa eBay Philippines business head Abhimanyu Lal. eBay said it received a "good initial response" when it held a concept auction involving three major banks and over 75 Manila-based used-car dealers to try out eBay Motors Philippines.